Today we actually stayed home and didn't run errands for a change. I'm trying to stay off my feet as much as possible because I've got something going on with my ankle. It is driving me absolutely crazy sitting around! LOL I kept dinner simple tonight. I wanted to make grilled chicken since we had some (with skin and bone) that needed to be used. 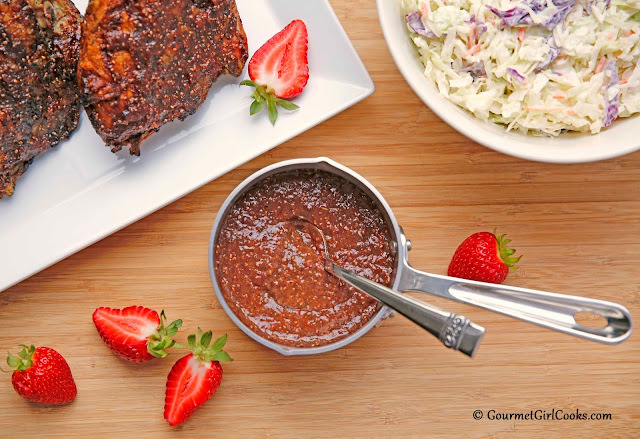 I wanted to put together a different kind of barbecue sauce with a strawberry base using the jar of my Strawberry Chia Jam that I had in the fridge. I looked around to see if there were any existing recipes that appealed to me and all of the strawberry themed barbecue sauces I came across also used ketchup. Besides the fact that ketchup has a lot of sugar in it, the idea of combining strawberries and ketchup literally turned my stomach. I wanted to taste strawberry...you know, sort of a "last hurrah" to summer (I'm hoping). I decided that strawberry would be the predominant ingredient in my barbecue sauce and I used ingredients that I had on hand to doctor it up. I wanted it to have the twang of vinegar, the natural sweetness of strawberry, a bit of heat from chipotle and the smoky/salty flavor from bacon. I really liked how it turned out and so did hubby who was skeptical at first. 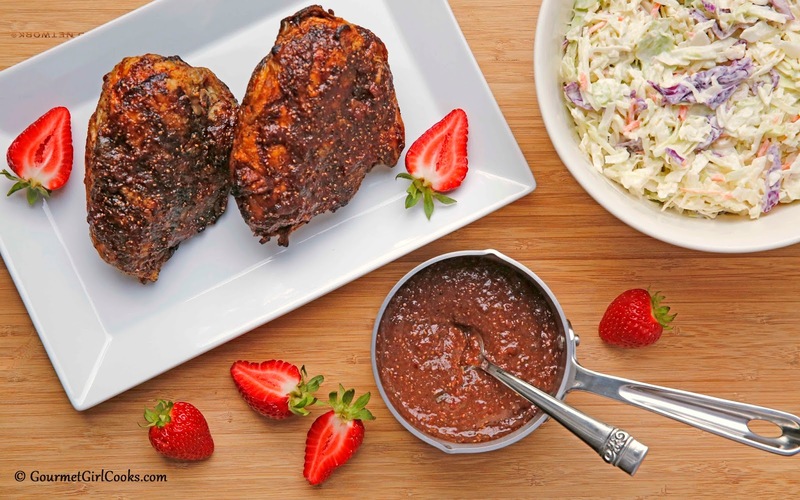 I made Strawberry Balsamic Chipotle Bacon Barbecue Sauce and we basted our grilled chicken with it during the last few minutes of cooking. If you are looking for a different sweet, tangy, smoky, slightly spicy sauce, this sauce fits the bill. After the sauce simmered and had thickened, I pureed it with my immersion blender and then stirred in half of the bacon bits so there would still be little bits of bacon in the sauce (the other half of the bacon was blended into the sauce so the flavor would go throughout it. 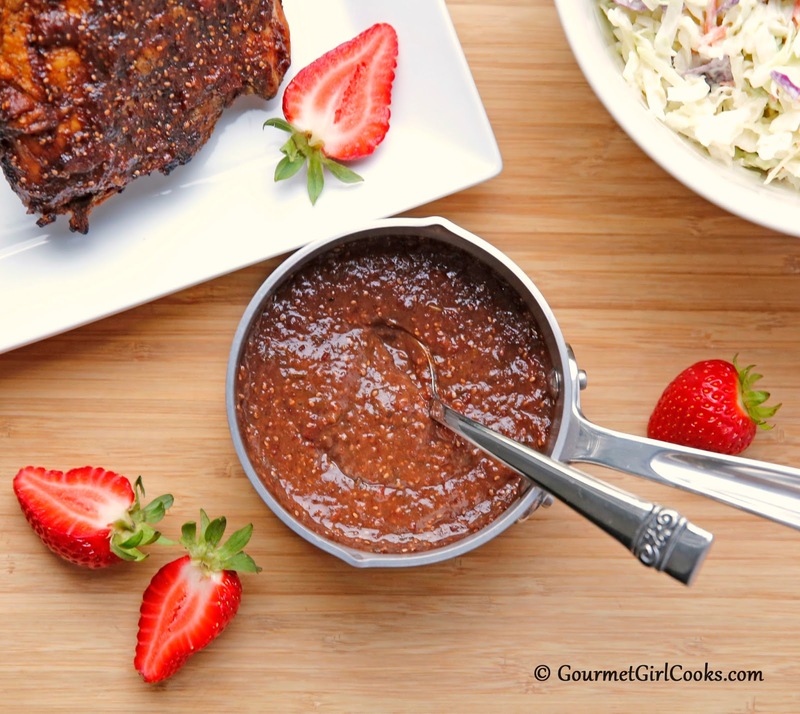 Since I already had the strawberry chia jam made, it only took about 30 minutes to make the barbecue sauce and I did that while hubby grilled the chicken. I also made my Easy Coleslaw to go with our barbecued chicken. I snapped a few photos below as well as included the easy peasy sauce recipe. Enjoy! In a 1 quart saucepan, brown diced bacon until crisp. Remove browned bacon and transfer to a small bowl using a slotted spoon (reserving bacon drippings in pan). Add onions to pan and saute for a couple of minutes over medium heat until they begin to soften; add garlic and cook about 1 minute. Stir in strawberry chia jam, balsamic vinegar, Tamari sauce, honey, molasses, dry mustard, chipotle pepper, smoked paprika and half of the bacon bits. Cook on medium heat until sauce begins to bubble gently. Reduce heat and let simmer until sauce cooks down and begins to thicken, about 10 to 15 minutes. Puree sauce with an immersion blender or in the jar of a regular blender until smooth. Stir in remaining half of bacon bits. Season with salt and pepper, to taste, and make any necessary adjustments. *Note: It's best to reduce and thicken sauce to desired consistency before adding salt or tweaking chipotle, balsamic, etc. since flavors concentrate as it simmers. This looks *really* tasty! You sure had your creativity in high gear on this recipe! I can't remember the last time we BBQ'd chicken. Don't actually know why that is exactly, but this sauce has me thinking about it again. :-) I bet it would be great on short ribs or baby back ribs, too. I'm sorry to hear that your ankle is giving you trouble. I hope you'll be feeling much better soon. Take care! Your BBQ-sauce sounds divine.-what a fantastic combination of flavors . I have to buy some white chia seeds as I only have the black ones .I missed the farmers market to get my organic berries. Well this post is again all over the place , please excuse the mess ! Unable to re-structure. So good to hear from you again!!! I hope you are doing well. I think my ankle is just a temporary issue and hope it will be better in a few days. No, I do not work at the post office...LOL and I do not work on my feet, I have a desk job, so I am good in terms of not having to stand on my feet. Thank you. I enjoyed the combination of flavors in the sauce. The first couple bites your brain was thinking "wow, strawberry" but with every bite I liked it more and more. I actually spread some on sliced turkey breast (Boars Head) and rolled it up this afternoon for lunch. I started the doTerra oils when I was in such bad shape 6 months ago, it was a desperate situation . My daughter finally convinced me to try the oils. Now I have diffusers all over the house ! I also take some of the oils internally . For all the joints that re already destroyed there is no help, the the joints that are being attacked now are less inflamed . I am spending a fortune on medicine that lowers my immune system (on purpose) and that could kill me. I am not supposed to attend gatherings or shake hands, which I m unable to do anyway. Restaurants are out too. So yes the oils are helping me presently ! When I am really depressed I keep people in mind that are worth of than I am and unfortunately there are plenty. Hope your ankle is improving.